Are you about to install an above ground pool and wondering how to avoid the most common above ground pool installation mistakes? In my nearly forty years of installing above ground pools I have seen them all. You see, when people make an above ground pool installation mistake, they call me to fix it. It is hard to know where to start, there are so many. Not leveling the ground would be a good place to begin. The most important part of installing an above ground pool is that it must be set on perfectly level ground. 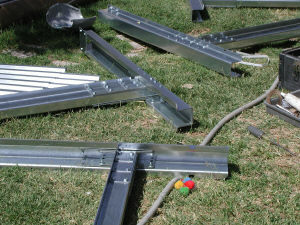 When installations are attempted on unleveled ground the results are never good. 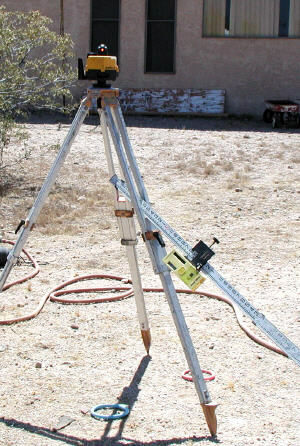 Attempting to install a pool on a base of sand is an installation mistake that is made a lot. The sand is a cushion for the liner only, the frame needs to sit on firm, level ground. If there is sand anywhere near the bottom rail when the wall is being installed it can become a real mess. The rail fills up with sand and the wall will not go in the way it is supposed to. An above ground pool installation mistake I see a lot is letting the sidewall stand without support. New sidewalls start looking used real fast when they are allowed to blow over a few times. Sidewalls left with no support, or held up with string or tape, will usually fall over a time or two. Every time they fall over they get dented, scratched and creased. If you build the pool frame as you install the wall it will never be left unsupported. It is also helpful to plan your installation so that when the wall goes up you have enough time to finish with the liner installation. The pool is only completely stable when it has water in it. Attempting to install a used liner has been the downfall of many do-it-yourself pool installations. Everything is going fine until that shrunk up used liner does not fit, things can go downhill fast at that point. At this point walls can blow down, or be pulled down from a liner that is to small. No matter how good the job was so far it can all be ruined quickly by trying to install a liner that will not fit. Used liners are hard enough for us pros to deal with, they should never be used by a home owner. Do yourself, your pool and your family a favor, buy a new Pool Liner. Oval pools are an installation mistake waiting to happen. The side braces can be very complicated and if they are not done correctly disaster can happen. You need to seriously consider your building skills before starting this type of installation. Be sure you have instructions and be sure they are followed. We get called to finish oval pools all the time because they are that hard. It is OK to say this might be over my head, let's hire a professional. My personal favorite installation mistake is to many friends and to many beers. The scene is always the same. The yard is nothing but pool parts and beer cans every where. The first hour is spent finding and sorting the pool parts and getting rid of the beer cans. We can then start to undo, and redo, what took a group of men all weekend to accomplish. Two people can easily build an above ground pool. This is a case where the more is not always the merrier. 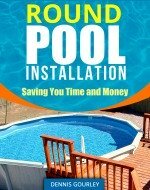 This page, Above Ground Pool Installation, shows you how two people can build a pool without any of these big time pool building mistakes.